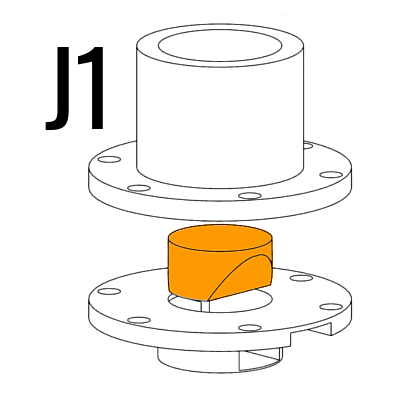 The J1 is a complete three-electrode electrochemical cell purpose-built for ATR-SEIRAS, shown here on the variable angle PIKE VeeMAX III ATR accessory. The teflon and glass construction ensures unbeatable chemical stability under intense experimental and cleaning conditions. Recessed spring-loaded pins make robust, reliable contact with the gold-coated crystal surface. 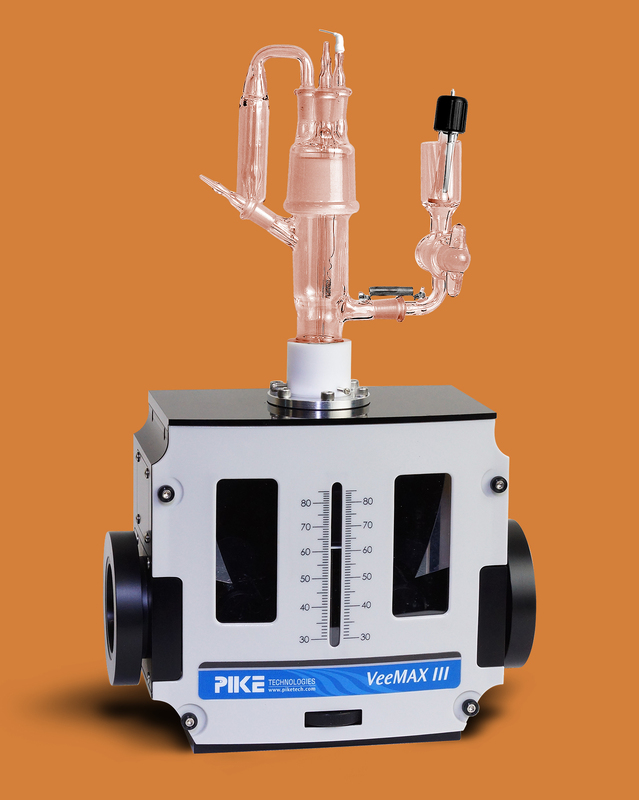 The supplied glass bubblers and gas trap allow the solution to be sparged with inert gas. Chloride migration from the reference electrode is mitigated by a ground glass stopcock and frit. Check out our product sheet! By using an anti-reflective coating, the PIKE Face-Angled Crystal (FAC) offers higher spectral throughput and increased signal to noise compared to uncoated optics. SEIRAS signals are up to twice as strong using the FAC compared to a conventional hemisphere. However, strongly absorbing Si phonon modes impose a low-wavelength cutoff around 1250 cm-1. 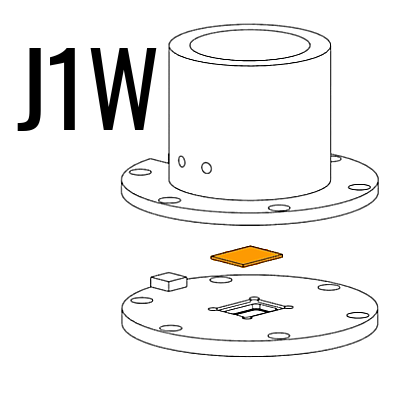 New in Fall 2018, the J1W accommodates ATR wafers by IRUBIS GmbH. Micromachined from 500 μm thick Si wafers, these are an inexpensive alternative to larger ATR crystals. The underside of the crystal is patterned with microprisms to enable excellent optical coupling. The low pathlength minimises throughput loss from Si phonon modes, allowing access to the complete mid-IR spectral range from 5000 to 400 cm-1. We've shown that these are an excellent substrate for electrochemical ATR-SEIRAS. Hybrid Gold-Conductive Metal Oxide Films for Attenuated Total Reflectance Surface Enchanced Infrared Absorption Spectroscopy. ACS Applied Nano Materials, 2019, 2, 1274-1284. Electrochemical ATR-SEIRAS Using Low-Cost, Micromachined Si Wafers. Analytical Chemistry, 2017, 89, 11818–11824. Femtomole Infrared Spectroscopy at the Electrified Metal–Solution Interface. Analytical Chemistry, 2016, 88, 9351–9354. Surface Enhanced Infrared Studies of 4-Methoxypyridine Adsorption on Gold Film Electrodes. Langmuir, 2016, 32, 2184-2191. Surface Enhanced Infrared Spectroscopy and Neutron Reflectivity Studies of Ubiquinone in Hybrid Bilayer Membranes under Potential Control. Langmuir, 2016, 32, 2225-2235. Charge Transfer and SEIRAS Studies of 1,4-Benzoquinone Functionalized Mixed Monothiol/Dithiol Self Assembled Monolayers. Electrochimica Acta, 2011, 56, 4361-4368. Interested? Contact us for more information about our products, including pricing and ordering information.